All-Courts™ Sport Tiles for Indoor-Outdoor Sports. 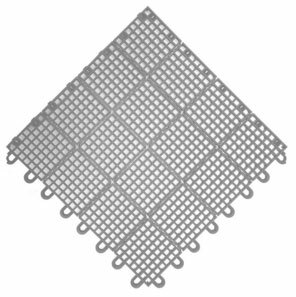 Game Court Tiles are Designed for Tennis, Basketball and Volleyball Courts. With Color and Textured Options. 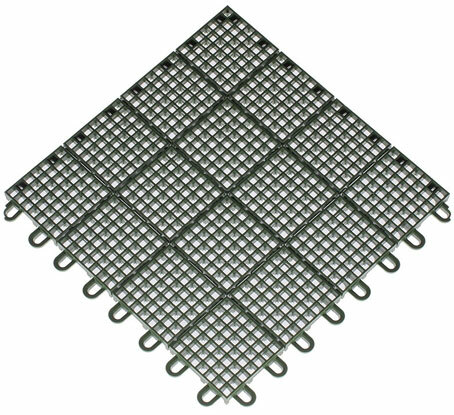 This is our MOST popular indoor and outdoor game court sport tile, perforated and interlocking. The holes provide for water drainage and an air circulation which helps maintain dryness and minimizes heat radiation, especially on concrete floors. This is ideal for outdoor courts and roof top flooring applications. 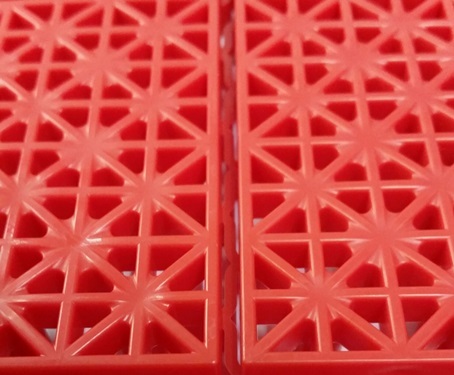 The Polypropylene (PP) for outdoor, PVC for indoors are interlocking plastic decking tiles designed to expand and contract when exposed to UV rays. Therefore, in order for this expansion to occur the outdoor decking tiles must be placed on a smooth cement or wood surface. Failure to do so may result in minor buckling of the decking tiles, a standard situation in all plastic sport tile. This is not disastrous because the tiles will settle / lay flat again after the temperature changes. This buckling is possible on soft roofing such as asphalt roof coating, rubber based electrometric coating, tar based shingles or over-layment in which the plastic tile ‘legs’ will prevent them from sliding. 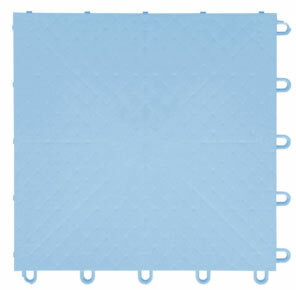 The outdoor plastic game court tiles must be able to slide on the floor or floor of the roof as the temperature changes. 1’x1’ modules snap securely together with 16 latch locks per tile to form a continuous surface of any size. Quick & easy installation on hard surfaces only because of heat expansions issues- Tiles need to slide on floor surface as temperature increases. Available in solid Polypropylene with a Load Bearing Capacity: 25,000 lbs/sq. ft.
1’x1’ modules snap securely together with 32 latch locks per tile to form a continuous surface of any size. Available in solid Polypropylene with a static load rating of 16,000 lbs per sq. foot. PVC options for a more flexible and softer walk, especially for bare feet. Description Dimensions under 300 sq. ft. between 300 -1000 sq. ft. over 1000 sq. 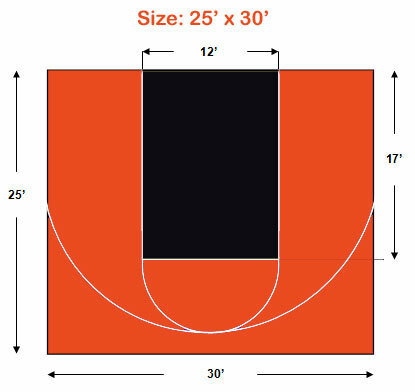 ft.
Corners (Solid or Flexible) 12" x 1-3/4" x 1/2"
Our American made plastic interlocking basketball and volleyball court tiles are designed for outdoor and indoor basketball courts, tennis and volleyball courts and more~! 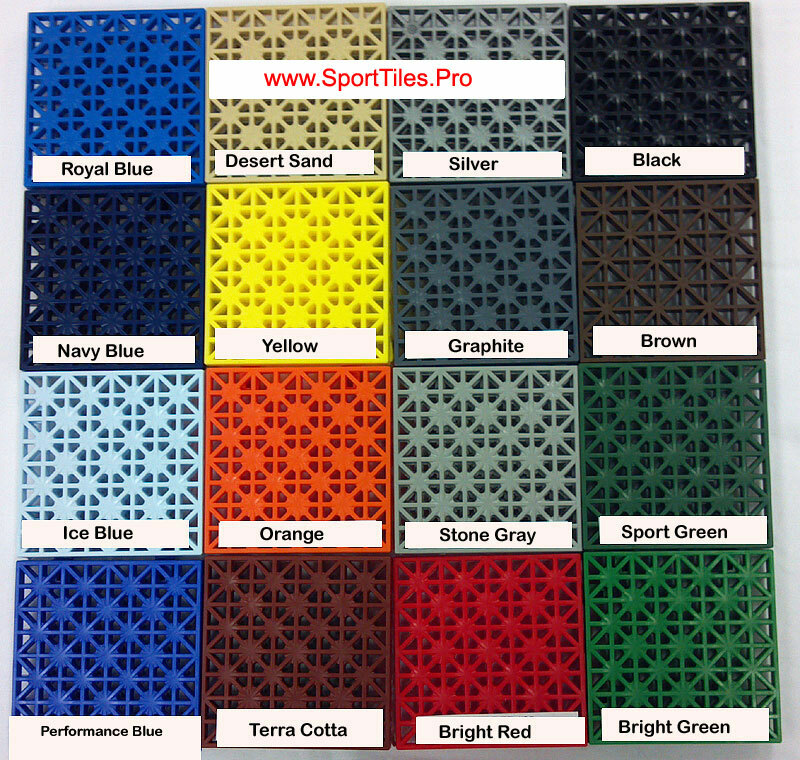 Plastic sport tiles are interlocking, available in 22 colors, anti-fatigue, weather & UV resistant. 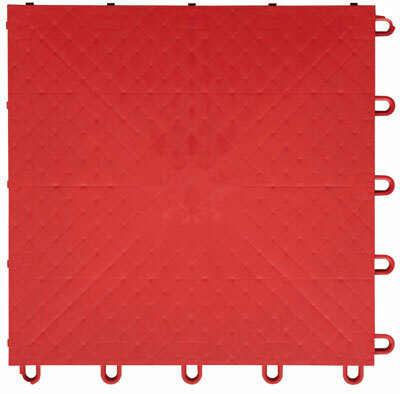 Multi-purpose sport floor tiles for basketball courts, tennis, volleyball, badminton and more~! Over time surfaced courts will peel and decay. Plastic interlocking outdoor tiles can accommodate all sports. Courts surfaced with All-Courts™ sport tiles will add anti-fatigue and anti-slip features. HomeCourt®: Blue Outdoor Basketball Court Tiles are Popular In Home Backyards. 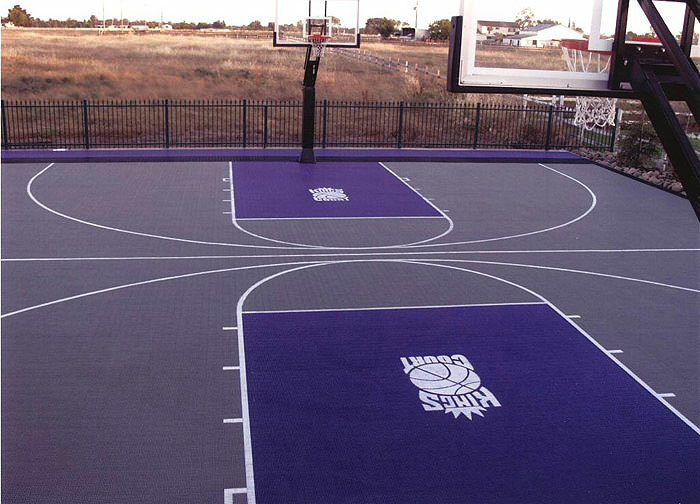 Purple basketball court tiles for home use. 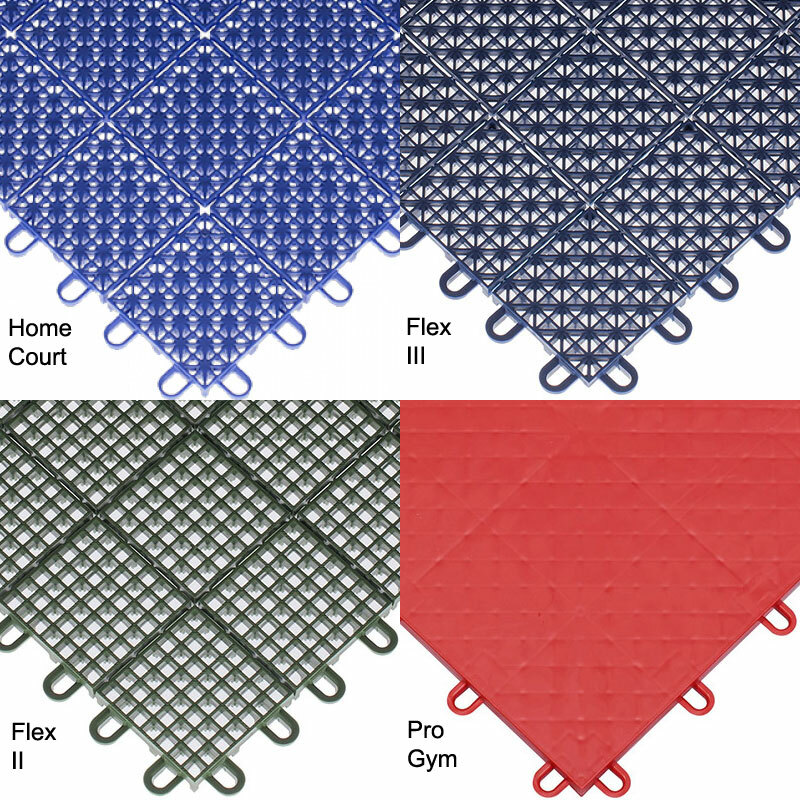 Flex III court tiles is popular for home-use and school tennis courts. 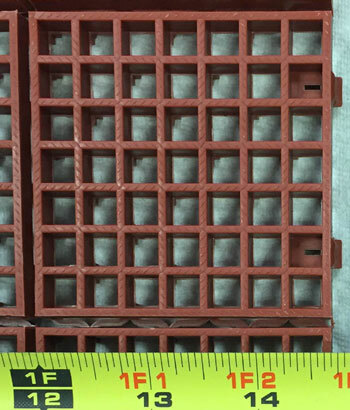 This tile is perforated for water drainage and will dry out faster, especially needed during outdoor tournament play and scheduled physical education classes. As well, though no outdoor sport surface tile is totally slip resistant-despite commercial claims- our outdoor sport surface flooring will provide moderate traction when wet and superior when dry. 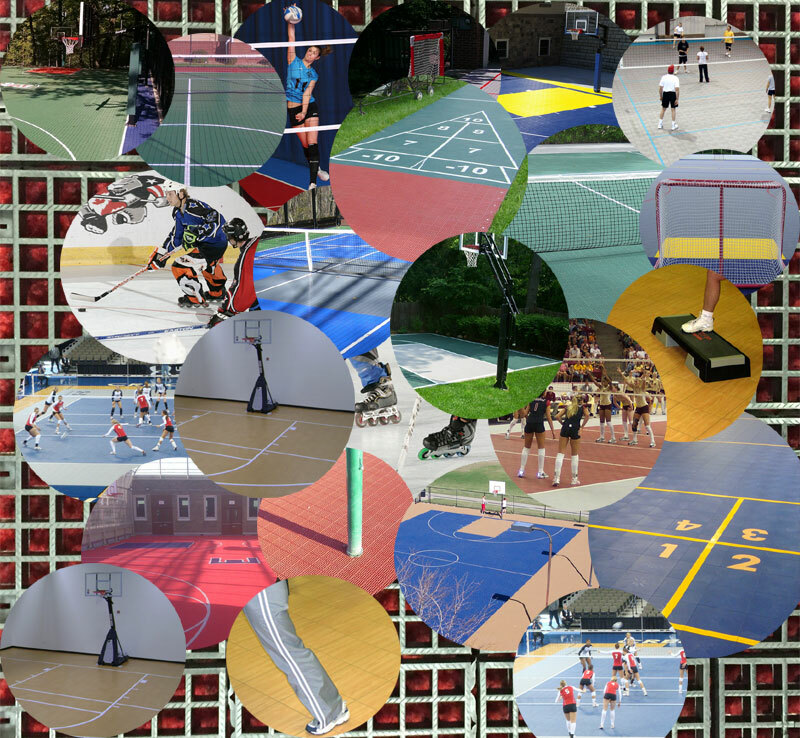 Ideal applications include flooring for outdoor basketball courts, volleyball, tennis, inline hockey, roller skates, etc. 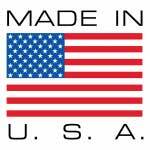 Sport tiles for backyard basketball court are Made in the USA. Flex III Size: 12" x 12" x 1/2" Weight: .73 lbs./sq. ft.
•	All sport use; basketball, tennis, volleyball, etc. •	Raised and flexible tiles provide loose-lay applications on uneven surfaces. •	Set-up time in 1 or 2 days. •	Include ‘elderly or mature’ playing in your play with our shock absorption attributes..
Volleyball: Born in the USA. 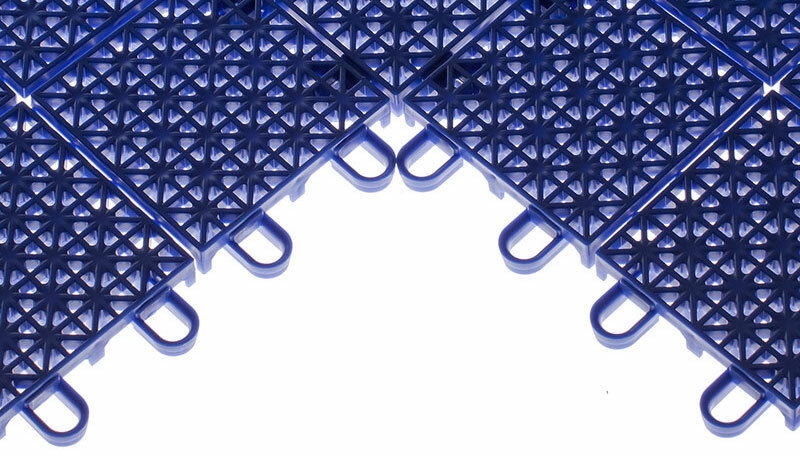 Micro-view of sport tile perforations. These perforations provide secure footing even on outdoor wet environments. Flex II- Size: 12" x 12" x 5/8" Weight: .75 lbs./sq. ft. The expansion joints on each sport tile will provide anti-fatigue properties to joints, especially knees, ankles and lower back. 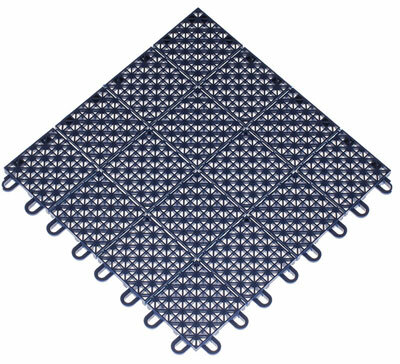 The interlocking court tiles will slightly move, rather, absorb the sudden stops, quick pivots and landings after ‘hang-time.’ This will add quality play; prolong high intensity practice or competition. Another advantage of the expansion joints is that the court tiles will loose-lay on imperfect substrate thereby minimizing buckling. Lastly, hot & cold temperature fluctuations will expand and shrink tiles. The expansion joints will greatly reduce bucking due to temperature changes. FLEX II offers the very best in design technology for your backyard, home or school court surface. Flex II surface combines the comfort and resiliency to support athletic play. 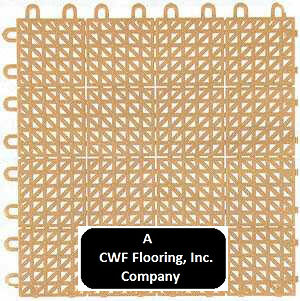 CWF Flooring, Inc's. 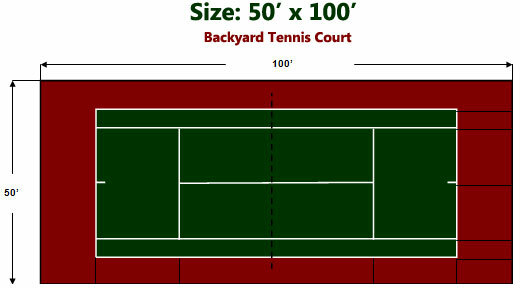 backyard tennis court tiles can be assembled without a flooring contractor. Mom, pop and the kids can assemble our US-made tennis court floor tiles. 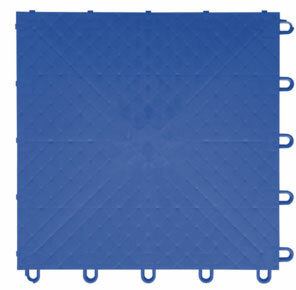 Made of resilient polypropylene ensures a stable tennis court for your backyard or school. The luxury of a residential tennis court is more than an accent to your backyard landscaping. It is an added recreation activity, for the entire family, neighbors and friends. A family that plays together stays together. Official, competitive or commercial tennis courts require durability and low maintenance. CWF flooring Inc's competitive tennis courts will meet your commercial needs and sport surface requirements of your recreational & professional tennis players. Concrete tennis courts are injurious for joints; injurious for the youth, adults and especially seniors. 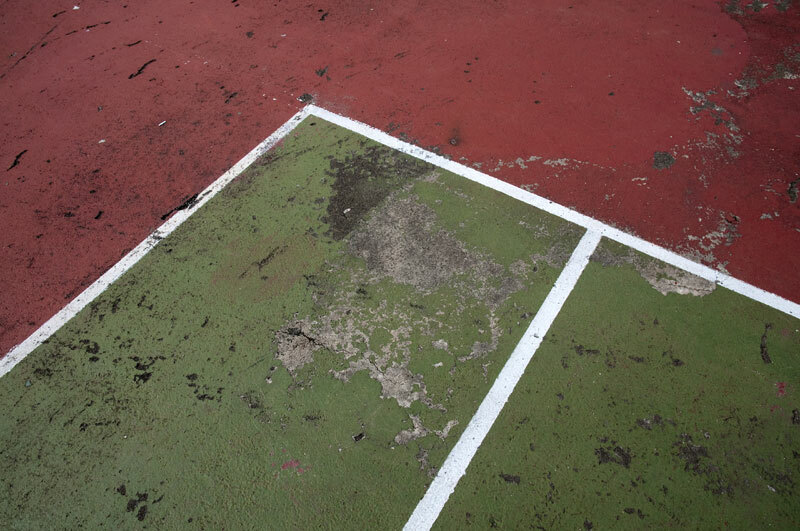 Whereas plastic court tennis tiles will minimize the wear and tear of ankles, knees and the back. Don't pulverize your meniscus or pull your Achilles tendon on concrete tennis courts. The anti-fatigue properties of flexible plastic court tiles will reduce pain, add longer playing time, reduce jarring on the joints and provide quality tennis play. Pictured Above: Reverse-side of outdoor court tile for all sports. The raised surface provide for water drainage for outdoor applications. •	No tools or adhesives needed to assemble. Multi-purpose sport floor tiles, for all courts: Basketball, Volleyball, Tennis Court and more~! Basketball courts with evergreen surface, gray key area, red lines & gray border. Green is full or nature. 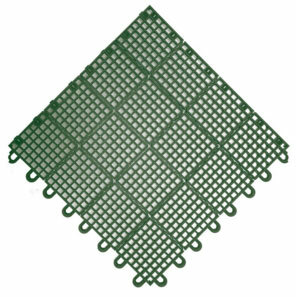 Green court tiles is a very popular color for basketball and tennis courts. 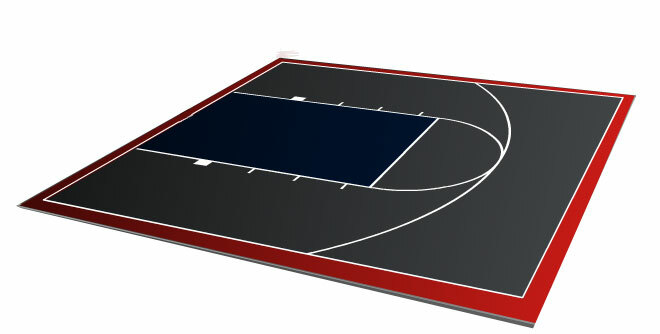 Half-court basketball court with gray surface, dark blue key, white lines with red border. Red borders act as a warning area. Gray's neutral color will less likely show dirt and shoe scuff marks. However, color gray is ho-hum to kids. Blue surface with red key, black lines & border. Blue is gender neutral. 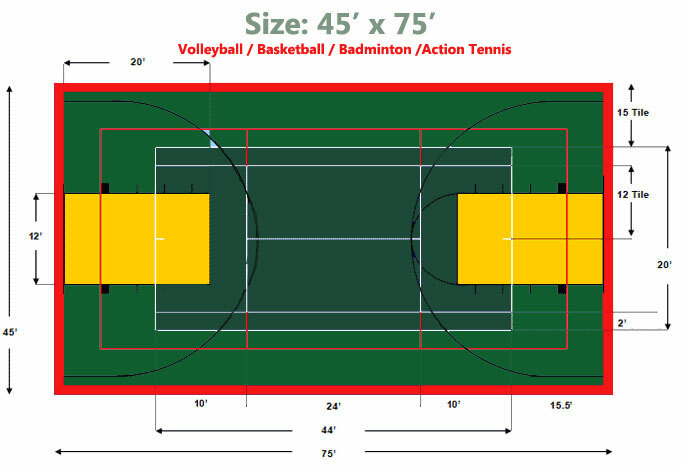 A 45' x 75' Multi-purpose court for volleyball, basketball badminton courts. Sport Surfaces Will Pay for Itself. If your school or church is entrepreneurial your newly purchased sport tiles can help raise funds for sports and education. Perhaps your school or church can designate every Saturday night for skateboard, roller-blade and/or scooter day. Design an obstacle course with orange cones, etc. include some music and charge admission per head. In a couple of months your investment for sport surface tiles will pay for itself. Another fund raising idea: Dance Night with Admission Street shoes are degrading for expensive wood gymnasium floors. Plastic sport flooring for courts will protect your investment wood gym floors, raise funds and bring communities together. "A school or church that dances together stays together." Basketball tournaments can raise funds. Charging admission for student or church attendees is poor public relations. However, admission can be charged to ‘outsiders,’ sport tournament participants and community organizations. Rent your gymnasium floor for dances, bingo night, swap meets, boy and girl scouts organizations, etc. An investment in court tiles is an will generate income for other sports, your school or church. 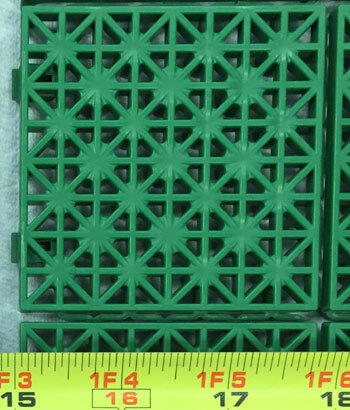 ProGym is a smooth top interlocking plastic tile. Applications include: Skateboard flooring, inline skating floors, dance floor , especially tap dance (vinyl dance floor rolls needed) Like all our court tile for sports, it's portable, low maintenance, free floating and easy to assemble and disassemble. Call the Sales Department For a Shipping Quote Now! Edges snap together on the sport tiles. Court tile edges are 12" long. Customer Rick of Los Angeles, California provided this photo of his garage floor. 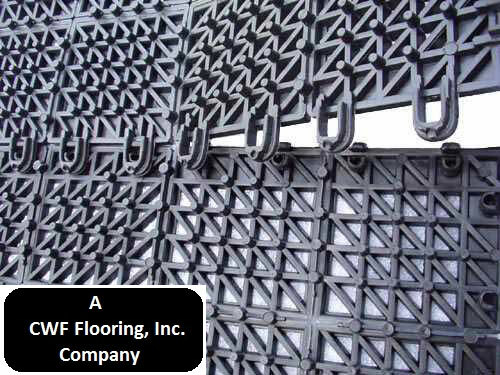 CWF Flooring, Inc. All-Courts™, patio floors and garage flooring is engineered and made in the USA! Car dealerships display there cars with All-Courts™. With our patent design our floors can stand up to the most brutal use-from commercial displays to some trucks displays. Our interlocking tiles can meet your needs and your creative designs with color, texture and patterns. 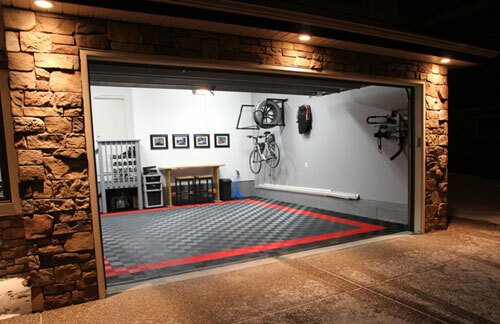 CWF Flooring, Inc. garage floor tiles are durable and low maintenance. Our garage floors tiles can accent any home style. 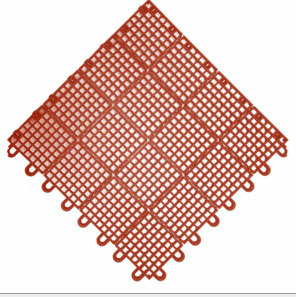 Perforated plastic tiles or non-perforated garage floor tiles can be used under cars, SUVs and some pick-up trucks. 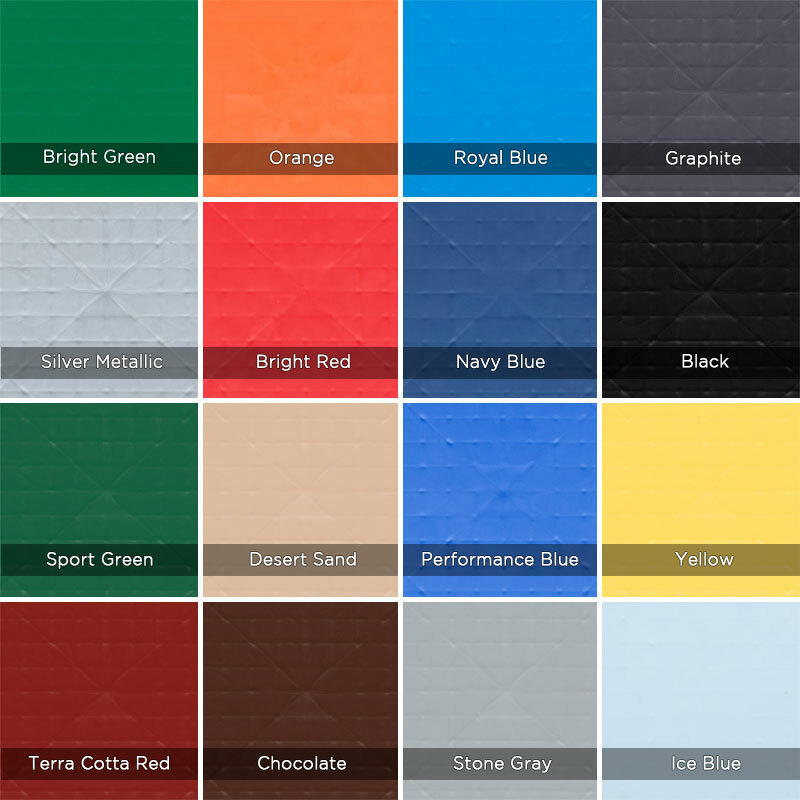 With 16 color options be assured we'll match your decor and/or the color of your cars. So easy to clean or mop, our plastic tiles for garage floors can be maintained without professional help. 16 color options are available Installation is basic. Flooring contractors need not be hired for this Do-It-Yourself garage flooring. Made in USA! 1. We live in Los Angeles, California and would like to use the plastic tiles for an outdoor tennis count. The court is under trees. We are concerned that falling leaves will cause additional maintenance problems? This will not cause a problem anymore than a sport floor without court tiles. The perforations on each sport tile- for all sports- will enable the outdoor tennis court tiles to be swept or hosed off. The holes are only 5/16 inch square small enough to minimize large debris from getting through the holes. As well, if they small pieces of leaves get through the holes they will be washed & flow away after they degrade and compost over a short time. 2. Our backyard has a floor drain that needs to be accessed for maintenance 4 times a year. Can we have access to this drain under the basketball court tiles? Yes, maintenance can have access to the drain. You’ll have to disconnect approx. 12 tiles just above the drain and reconnect them after the maintenance job is complete. 3. My family has been playing outdoor volleyball on the grass for years in our backyard. We are well known in our community just outside of Dallas, TX for our volleyball court. The problem is the grass is slippery even when it’s not wet. Can we place your outdoor sport tiles on the grass and dirt in our backyard? Yes, CWF Flooring, Inc’s., All-Courts™ Pro can be used in this environment. However, grass will grow and sprout through the small holes in the court tiles. We recommend using grass killer under the court tiles. 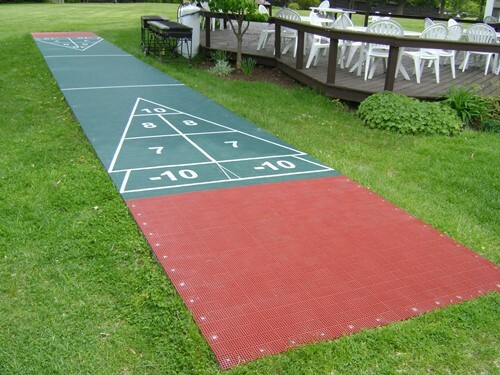 Sport activity can continue even if the tiles are wet; they are anti-slip. 4. Our property management company in condo in North San Francisco, CA would like to place water-proof plastic tiles around our jacuzzi and swimming pool area. Will the Home Court tiles suffice? The Home Court, Flex I & II will be harsh on bare feet. 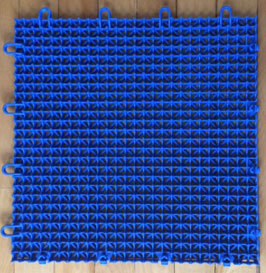 We suggest the SoftFlex plastic decking tiles for boats docks walkways, swimming pool area, locker-rooms and shower rooms or anti-fatigue water drainage mats which are perforated rubber floor mats. 5. My sons and I have basement where we lift weights, etc. my daughter uses the same room for ballet. Can we use the sport tiles for dance and as a weight room. No, sorry. 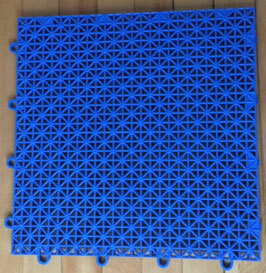 The high impact polypropylene sport tiles can not withstand to dropping of heavy weights. You'll have to use rubber weight-room tiles for weights and the All-Courts™ Flex as a dance floor or vinyl rolls for dance. The plastic sport tiles will have superior acoustics for tape dance. 6. Can the garage floor tiles be used outdoor? Yes, absolutely. The garage tiles are UV resistant and will maintain it's color over sun-exposed time. 7. Our outdoor basketball court is divided by a walkway of carpet tiles? 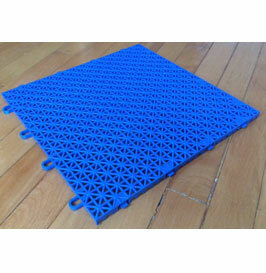 Can we place the perforated plastic tiles on the carpet? We are not sure. Actually, we can't see a reason why you can't place the outdoor sport tile on carpet. You'll have to use your judgment. Just make sure there's no tripping hazard. 8. 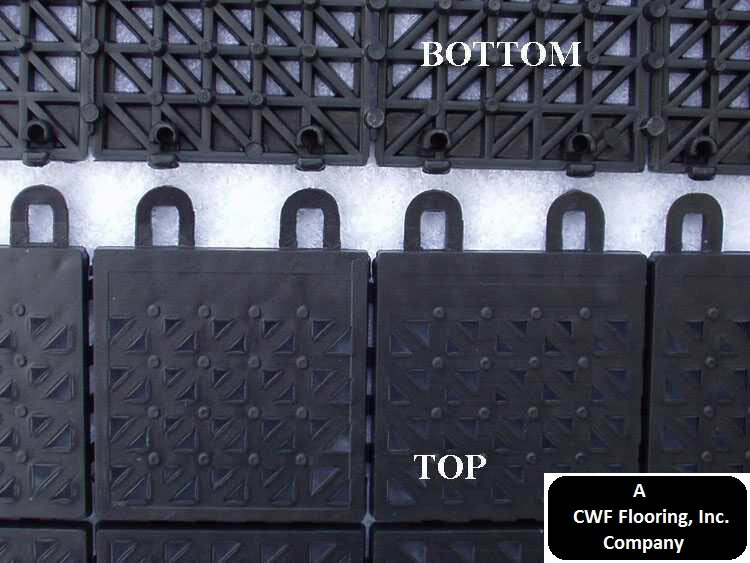 Two years ago we ordered plastic court tiles from CWF Flooring. We would like to move theses indoor tiles now and buy new court tiles for the outdoors. Do you foresee any problems? Either the All-Courts™ Flex, Flex II or Flex III is recommended. The HomeCourt© has more flat surface / smaller perforations. 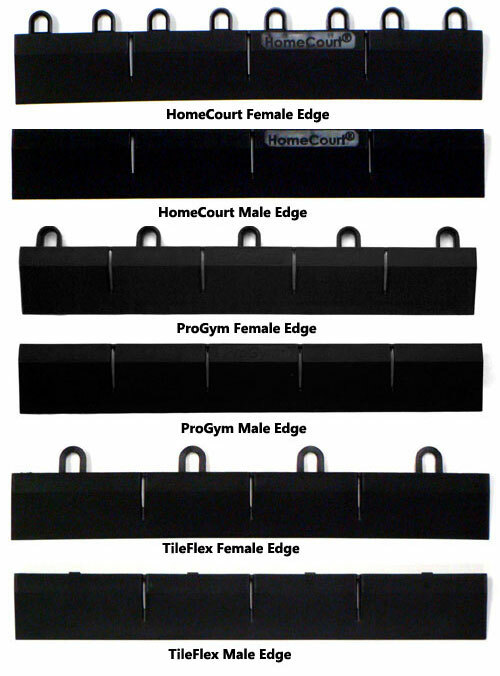 All of our sport tiles will work well for all courts. 9. What kind of tile do you recommend for a concrete outdoor tennis court? 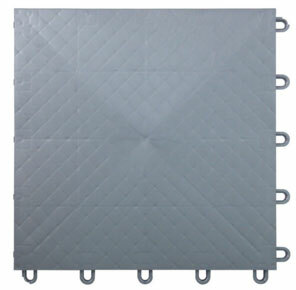 Outdoor court tiles, made of polypropylene (PP), are appropriate for indoor or outdoor sports. 10. I’m a buyer for a city school districts in California. We have read the specifications for your outdoor sport tiles for tennis courts. What’s the psi for this tile? 16,000 psi. This is very strong and durable enough for a car to drive on the court. Sport activity generates substantially less than this at peak force. Our American made sport tile for all courts will accommodate any force a human can generate from any and all sport activity. 11. Before we proceed with one of the two estimates you emailed us I have a question. One estimate was for with the rubber sub floor. How much of a difference will the rubber sub floor make on the performance of the sport? Frankly, the rubber underlayment under the court tiles /sport tile will not definitively enhance the performance level. We are not [blank] sport shoe company who make false claims. What the rubber sub floor under the court tile will do is prolong a high strenuous game because the stress on the joints will be reduced. 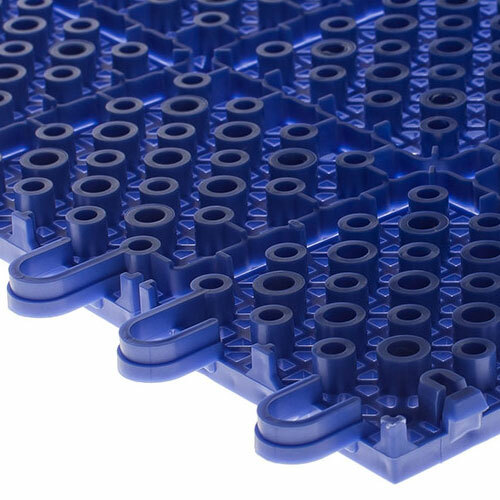 We highly recommend the rubber sub floor-not to make a buck- but because it will prevent, rather minimize pre-mature wear n’ tear on the joints, especially the lower back. If the clientele is for both kids and adults this make it more of a necessity. Senior citizens will benefit the most. If the sport tiles are for a business based on membership / usage of the courts, then the rubber sub floor for the outdoor courts tiles will be a good return of investment. 13. Our family consists of two boys and two girls. The boys play volleyball and the girl play basketball. The question is: Can your sport tiles for outdoor courts accommodate both V-ball and B-ball? Yes, absolutely. The footwear are similar for both basketball and volleyball; as well, both V-Ball and B-Ball involve pivoting on the ball of the feet. The point is, that the perforated sport tiles will not fully restrict pivoting. 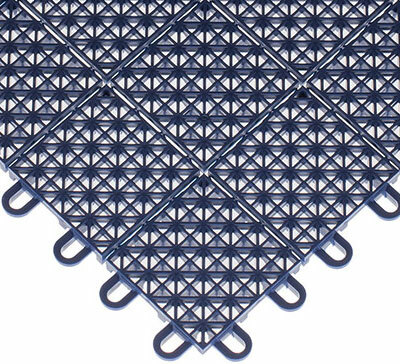 Air-time and it's ballistic landing requires an anti-fatigue court tiles with anti-slip features. 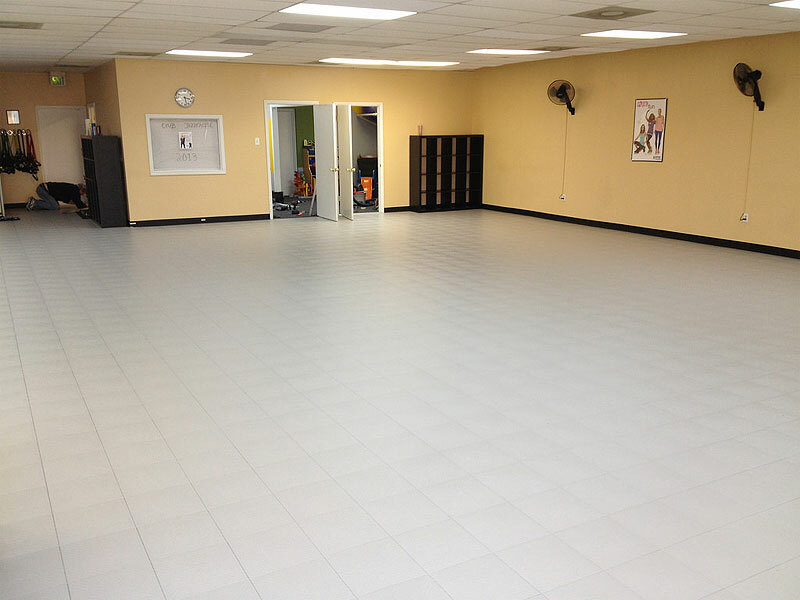 CWF Flooring, Inc. sport tiles is designed to flex and absorb when landing. This will help minimize wear and tear on the joints. 1. 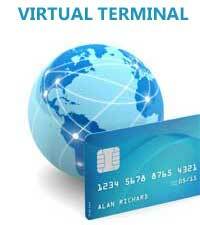 To pay order & shipping balances via credit card. 4. Orders that will be picked up at our factory/orders that will not pay for shipping charges.